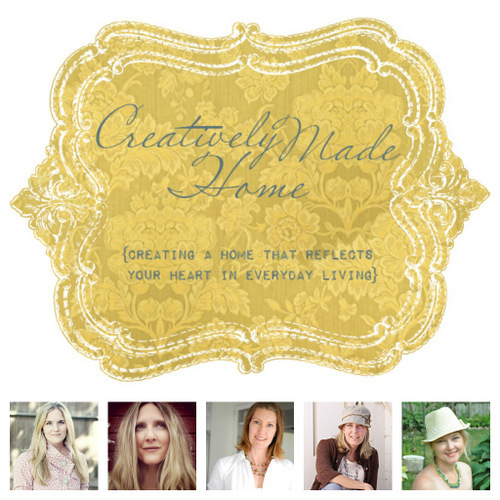 urban farmgirl: creatively made home...STARTS MONDAY!! Last call to get your registrations in for this incredible e-course, girls!! Monday all the fun begins! The 5 lovely ladies shown above have put together an amazing line-up of videos, Q&A sessions, recipes, photos and a private Facebook group so you can connect with other people take the course! You've seen their blogs...these girls KNOW what they are talking about. They have good advice on all things home. I don't know about you, but I get a little flustered when I know the Holidays are coming. I want my home to look cozy and inviting, yet fresh and put-together. Such pressure, don't you think? Well, I for one, am hoping for a new perspective on my home with this course. I just want to take the pressure off and ENJOY! I am focusing on my home office and guest bedroom this month...I am switching rooms and giving each a new look! I am so excited to get inspired and get to work! * Each week you will have amazing truthful videos from not only the five teachers but other creative women. * Videos that truly reflect what life is like in each of their homes. The stuff that life is really about. Want in on the fun?? I am already registered, so hope you will be, too! Click the button below to go to Jen's blog and register..